If you are anything like me, nothing keeps you on your toes quite as much as entering an unfamiliar marina for the first time. You may need to take on fuel, pick up supplies, tie up for a night on the town, or put an end to a long day’s transit. Imagine that you’ve just hailed the dockmaster on your VHF and he or she wants you to pull up to the fuel pier port side to (place your port side against the pier, seawall, or wharf). But…are you prepared just in case you need to switch sides and tie up starboard side to? This can happen if in an unexpected wind or current makes the planned approach side dangerous. Prepare for the unexpected now while you are still in open water and not in the confined spaces of a marina. 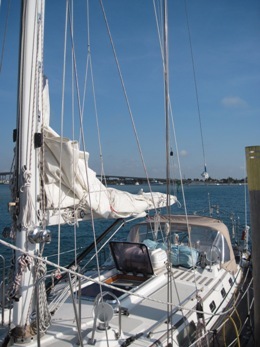 Rig BOTH sides of your sail or power boat with docking lines. Rig BOTH sides of your sail or power boat with fenders. Now you are ready to tie up your boat on either side without a last minute mad scramble to shift lines and fenders! Make the boat-hook ready to go and handy in a second. Place the boat-hook within arms-reach of the crew working the bow. Extend the boat-hook all the way. Collapsed boat hooks might be cool for easy stowage below, but you will appreciate that extra length if you need to retrieve a docking line or loop the eye of your own docking line over a piling or cleat. Get two boat anchors ready. Not one—two. The bow anchor works fine when you are going astern. But what happens if you lose your engine and still have forward momentum? You may need to stop or slow to a dead crawl to avoid hitting another boat or structure. Rig a small, easy-to-deploy stern anchor that you can drop astern. Attach just line to this anchor, because you want it lightweight. Even if you drop the stern anchor and it fails to bight, it could help slow the boat to a crawl. Assign a roving fender to one crew. Even if short-handed, you need a spare, unattached fender that someone can walk around (rove) to cushion contact points. No pre-hung fender can do this as well. A roving fender in the hands of an alert crew can save you huge repair costs on your boat or another boat in case of unintended contact. Attach a long length of spare rope to both ends of the fender. This will form a loop. Hold the roving fender in a vertical position for smooth surface contact. Shift to a horizontal position to spread cushion protection over more area. 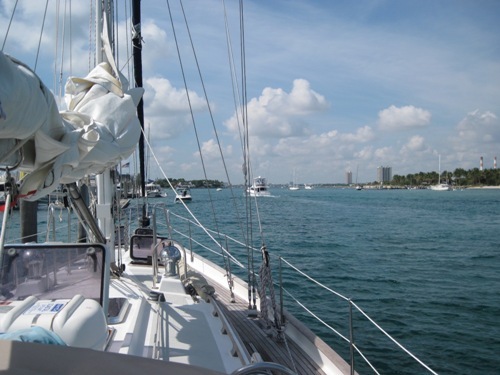 Remember this mantra when boating or sailing: Crystal-Clear-Communications. Work out communications with your crew ahead of time, so that you can talk to one another—without words. For example, imagine that you are unable to talk to your mate. He or she stands at the wheel with the engine noise and maybe some strong wind and rain. You are way up at the bow. Who has the vantage point to give distance to the dock? Who can tell right away whether the boat needs to slow down on the approach? Or needs to come just a bit to the left or right? The person on the bow can see all of this—without any “blind spots”. And that’s a huge advantage! Try something similar to the set of signals we used on Coast Guard buoy tenders. Distance to the dock? Hold your hands up like a football referee giving a touchdown signal. Fists closed. Thirty feet? Flash ten fingers three times (open your hands, close your hands; do this 3X). At six feet or less, spread your arms wide with palms up. Bring your palms together in slow motion as the boat approaches to less than six feet. This gives perfect guidance to the person on the wheel or tiller so that they can regulate rudder, throttle, and shifter to perfection. Add these three vital steps in your Prepared To Approach (PTA) strategy today to lower the stress that comes with maneuvering in tight quarters. Become the true master and commander of your small vessel--wherever in the world you choose to cruise!